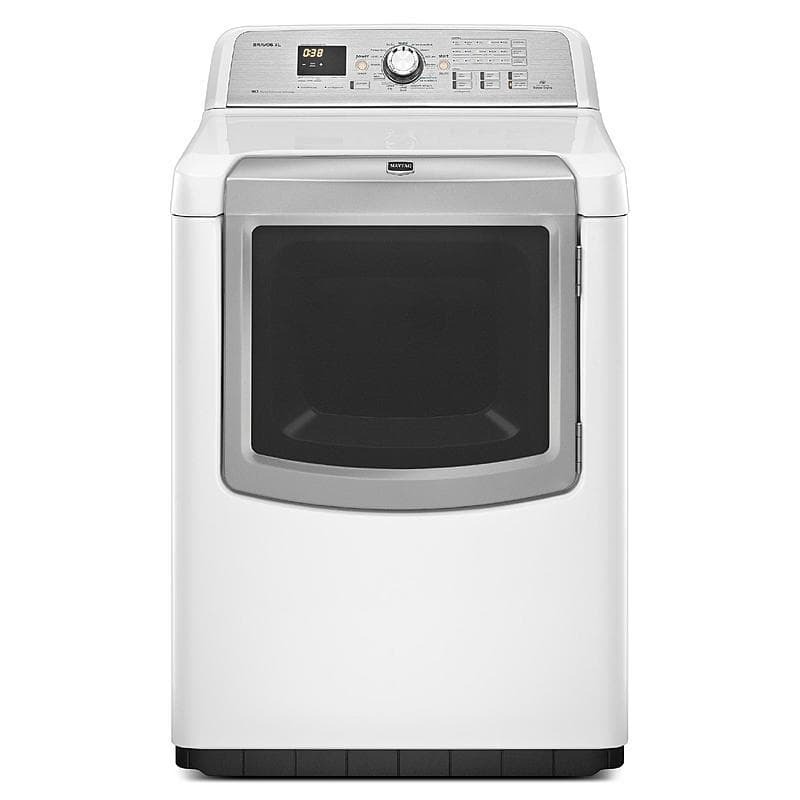 Maytag MEDB980BW 29" White Electric Dryer 7.3 Cu. Ft. Extra Large Capacity 7.3 cu. ft. capacity provides enough space to evenly dry your large loads. Evenly Dries Your Largest Loads Advanced Moisture Sensing provides even drying for your large loads. Maytag Commercial Technology on Bravos XL Every Maytag Bravos XL dryer features long-lasting, commercial-grade components for your home, including a durable high-performance motor and a 5-rib dryer belt. Advanced Moisture Sensing Uses three sensors to monitor temperatures and moisture levels. Such precision gives you even drying that virtually eliminates overdrying-and it still helps you save money. Enhanced Airflow Monitor Capable of venting straight for up to 100 feet. Checks for any restrictions of airflow at the start of every cycle, then provides a convenient visual display of the dryer's venting performance. Custom Refresh Steam Cycle After selecting the number of garments to steam and pressing start, a fine mist is sprayed into the heated dryer drum as it tumbles, creating steam to help touch up loads that have been left in the dryer too long. EcoNormal Cycle EcoNormal saves energy when drying by removing a little less moisture before ending the cycle. Sanitize Cycle The Sanitize cycle removes 99.9% of common bacteria from clothing and fabrics. Auto Refresh Steam Cycle Smooth out wrinkles and reduce odors in as little as 15 minutes. A fine mist is sprayed into the heated dryer drum as it tumbles to create steam. High-Efficiency Dryer This high-efficiency dryer saves energy by stopping clothes when they're dry and not prolonging the cycle, delivering optimal efficiency. Reduce Static Option A fine mist is sprayed into the heated dryer drum at the end of the cycle to create steam and help reduce static in the load.